The University of Utah’s Department of Theatre presents Stephen Sondheim’s Tony Award-winning musical comedy “Company.” Directed by Ryan Emmons, the production runs over three weekends Feb. 15-March 3 in the Babcock Theatre in the lower level of the Pioneer Memorial Theatre, 300 South and University Street. This Tony Award-winning musical for Best Musical, Best Score, Best Lyrics and Best Book by Stephen Sondheim and George Furth exists outside the realm of your typical chronological piece of theatre. Set in present-day New York City, “Company” follows bachelor Bobby on the event of his 35th birthday as his friends gather to celebrate and offer varying degrees of relationship advice. Their interactions are presented in a series of vignettes that explore the social pressures of being single, in love or in a relationship. With popular and familiar songs such as “Another Hundred People,” “Marry Me a Little,” “The Ladies Who Lunch,” and the iconic “Being Alive,” the cast brings the show to life through intimate scenes, intricate music and exciting dance numbers. Guest director Ryan Emmons brings a fresh perspective to the Babcock Theatre by tackling an ambitious musical with a young company. His work as resident director on the U.S. National Tour of “Miss Saigon” and assistant director of “Groundhog Day” and “Matilda the Musical” on Broadway adds to the professional environment the U’s Musical Theatre Program strives to create for its students. 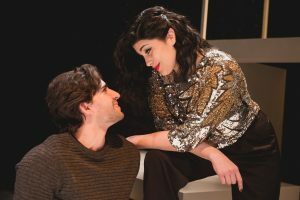 His vision coupled with music direction by Alex Marshall and choreography by Ellie Hanagarne makes this production of “Company” as entertaining and relatable as it was when it debuted in 1970. The audience is invited to join the director, members of the cast, and creative team for a talk-back immediately following the 2 p.m. performance on Feb. 17. Feb. 13 & 14 | 7:30 p.m.
Feb. 15, 16, 20, 21, 22, 23, 27 & March 3 | 7:30 p.m.
Feb. 17, 23, 24 & March 3 | 2 p.m.
ASL interpretation on Saturday, Feb. 23 | 2 p.m. Location: The Babcock Theatre, located at 300 South and University Street (1400 East) in the Simmons Pioneer Memorial Theatre, lower level. Free parking is available at the Rice-Eccles Stadium. Phone: 801-581-7100 | Online: tickets.utah.edu | In person: Performing Arts Box Office located at Kingsbury Hall. Content warning: Children under four years of age, including babes in arms, will not be admitted. Mature themes.